Masters Of The Universe Classics: Illumina Day! 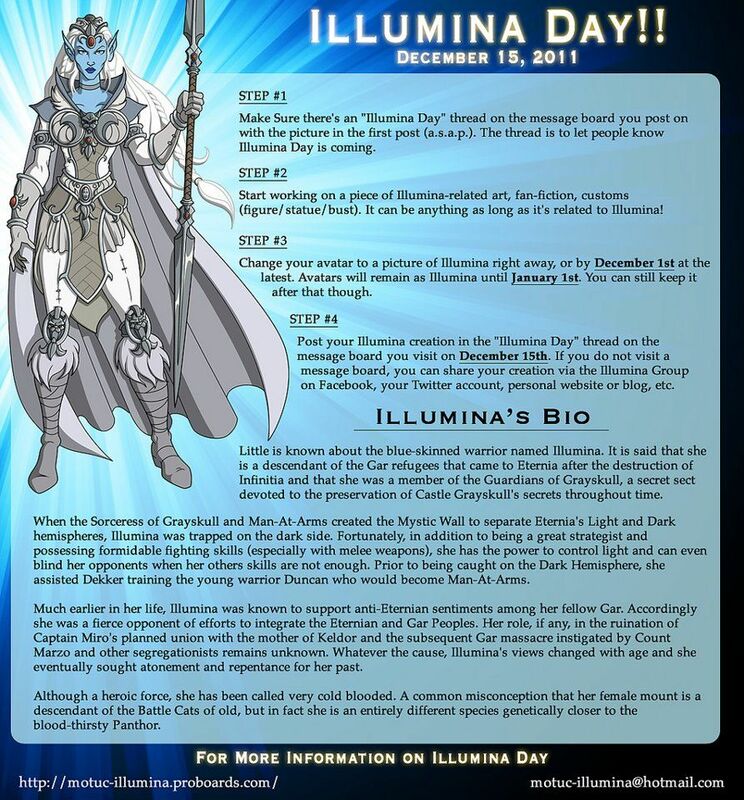 Today is Illumina Day! If you support seeing this character added to the MOTUC line, please take a gander at the image above and follow the steps to show your support. ...And while you're at it, please head over to the Illumina Facebook Fan Page and click "like". The more likes we get, the better the chances that Mattel will realize the worth of adding her to the line. To celebrate Illumina Day and thank you for supporting the page, we are going to pick one "fan" from the page at midnight tonight to receive a special prize: A DCUC Vs. MOTUC Aquaman Vs. Mer-Man Action Figure 2 Pack! All you have to do to be eligible for the contest is "like" the page! It's that easy! Oh- and we are still doing quota giveaways at the page as well! For every 250 fans we get up until we reach our goal of 5000 fans, we will randomly award one fan with a prize. Our next goal is 500 fans, with the prize being a MOTUC Vikor! Since we are only about 100 fans away from this goal, we may actually end up with 2 giveaways today if enough fans "like" the page (the DCUC Vs. MOTUC pack and the Vikor). So spread the word MOTU fans!